The advent of locomotives and the spread of railways symbolized the Industrial Revolution, delivering the outputs of factories and cities to distant markets and battlefields. Napoleon and the French Revolution introduced the concept of mobilizing entire nations for war; the American Civil War demonstrated what massing of forces could achieve, when thousands of men arrived by rail at the front in days, not weeks. Increased activity on the western Russian railroads were the trigger for imperial Germany’s mobilization in the run-up to war in 1914. It’s easy to see why such a symbolic and useful machine would end up drafted into combat, although the very notion of a fighting train seems to come more from the steampunk universe than a practical real-life military organization. Trains are restricted to their fixed and vulnerable rails and are among the first targets for artillery, airstrikes and sabotage. But derailing a train is actually harder than it looks, and the railroads’ tremendous cargo capacity allowed the machines to pack some serious heat. Given the wretched state of roads throughout much of the world in the 19th and 20th centuries, the armored train concept enjoyed a surprisingly long life. Strategic realities of the 21st century may even revive the idea. Upgrading locomotives and rail cars was straightforward enough. The same production pipeline producing iron and steel for boilers and rails produced plenty of armor plate. The earliest weaponized trains of the American Civil War simply added “railroad batteries,” armored boxcars bearing cannon and rifle ports. 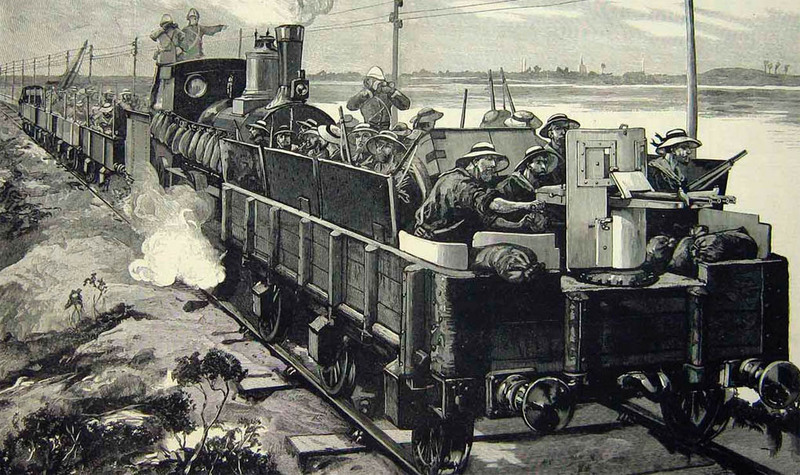 The British employed armored trains along its steel sinews of empire in India and Africa. A troop transport could add some armor plate and mount a few guns to keep the locals at bay while soldiers delivered the Queen’s chastisement. In 1899, a young Winston Churchill famously rode an armored train deep into Boer country, where he was captured and made a daring escape. The nations of continental Europe built the most involved armored trains, with Russia predictably out in front. One baroque Tsarist contraption, the Zaamurets, was designed and used as the terrestrial equivalent of a naval cruiser. A heavily armored self-propelled railcar mounting twin 57-millimeter gun turrets and bristling with machine guns, the Zaamurets (there may have been only one) saw action on the Eastern Front, the Russian Revolution and the Russian Civil War, during which it traveled halfway across the world along the Trans-Siberian Railway before winding up in Japanese service in China. Poland and Czechoslovakia invested in armored trains during the inter-war period, including the zany scout-cars called drasines, which were essentially rail-mounted light tanks. Towed along or carried on a flatbed during transport, an un-limbered drasine would precede an armored train into hostile territory to survey the rails and draw out fire. The Nazi assault in 1939 destroyed many of the Polish and Czech trains, but the Germans, who deployed some of the most elaborate armored trains in history, quickly re-flagged and re-used the conquered war-wagons for use against the Soviets. The Wehrmacht most often used its trains as mobile forts loaded with troops and tanks — and became an effective, fast-moving occupation force. The Soviet Union continued the development and deployment of armored trains begun by the Tsars, and used the machines throughout the Great Patriotic War. Rather than mobile forts, the Soviets used their trains as railway fire support and armored reconnaissance. One specialized armored train, the MBV-2, bearing a family resemblance to the Zaamurets, was used at Leningrad and Sevastopol as well as the Eastern Front. Over the course of the war they were fitted out with anti-aircraft guns, tank cannons and even naval rifles. The Atomic Age ought to have shoved such retro-weapons into the history books, but even intercontinental ballistic missiles suffered from being big, heavy items to move around. To contend with their nation’s terrible road network and enormous size, the Soviets morphed the armored train into a stealthy city killer. In 1987 the Strategic Rocket Forces began deploying its city-buster weapons on Soviet railways. The SS-24 Scalpel ICBM consisted of a covered railcar along with support and maintenance facilities, security troops, a fuel tank car and three locomotives to haul a 104-ton missile and its court. Dispersed across the vast Soviet rail network, looking much like other freight trains, the Scalpel was a targeting nightmare for the Pentagon. The rolling weapon system with its 10 reentry warheads was banned by the 1991 START II treaty, dismantled and put on public display. This was one case where the Soviets trumped their American counterparts. In the 1980s, the U.S. Air Force tried mightily to get its MX “Peacekeeper” ICBM mobile for the same reasons as the Soviets: stealth and safety. The carpet-smoking “racetrack” mobile-basing concept, roundly jeered in public, actually masked a far more practical (and worrisome) plan to create U.S.-style missile trains to rove the American rails. America’s strong push for ballistic-missile defense in Europe have pushed the Russian leadership to revive the missile-train idea. The so-called “New START” treaty that came into effect in 2011 does not bar railway-based missile systems and the Russian defense industry now has experience with new ICBM designs. A missile half the weight of the SS-24 is under consideration specifically for rail deployment. As arms control wonk Jeffrey Lewis noted, mobile launch platforms are often overlooked as proliferation hazards. Consider this: The Scalpel required three locomotives to pull its mass, something any CIA analyst could look for. Realizing this, the Soviets actually considered using a nuclear-powered locomotive before realizing that a gas-turbine machine powered by abundant Russian natural gas could do the job just as well. If Russia were to begin mass-producing natural-gas-fired gas-turbine locomotives, that might be something significant.